Chain Cross Security PowerPoint Templates And PowerPoint Themes 1012-This PowerPoint Template Targets the Security in Life, Business as shown above. This Template points to the Chain Security which signifies Team Work. It shows the number of chains crossed together to secure the family ,Business etc.-Chain Cross Security PowerPoint Templates And PowerPoint Themes 1012-This PowerPoint template can be used for presentations relating to-"Chain cross, security, business, chains, success, leadership" Our Chain Cross Security PowerPoint Templates And PowerPoint Themes 1012 have a definitive approach. Lead your audience to achieve their aim. Be an organizational driver with our Chain Cross Security PowerPoint Templates And PowerPoint Themes 1012. They will make you look good. 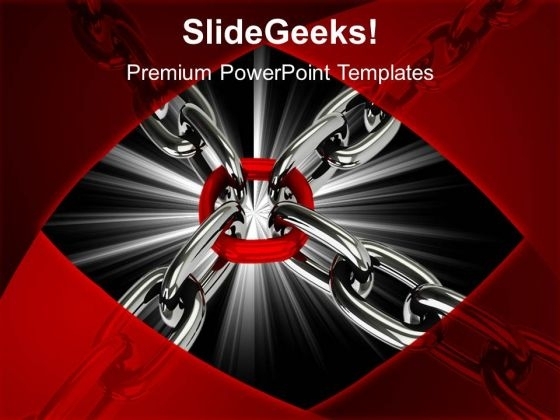 Chain Cross Business Security PowerPoint Templates And PowerPoint Themes 1012-With these pre-designed chains you can visualize almost any type of concept, chronological process or steps of your strategies. This Targets the Security in Life, Business as shown above. This Template points to the Chain Security which signifies Team Work. It shows the number of chains crossed together to secure the family ,Business etc.-Chain Cross Business Security PowerPoint Templates And PowerPoint Themes 1012-This PowerPoint template can be used for presentations relating to-"Chain cross, security, business, chains, success, leadership" Achieve strategic & tactical operations with our Chain Cross Business Security PowerPoint Templates And PowerPoint Themes 1012. They will make you look good. Let creativity flow with our Chain Cross Business Security PowerPoint Templates And PowerPoint Themes 1012. Your thoughts will develop an aptitude for it. 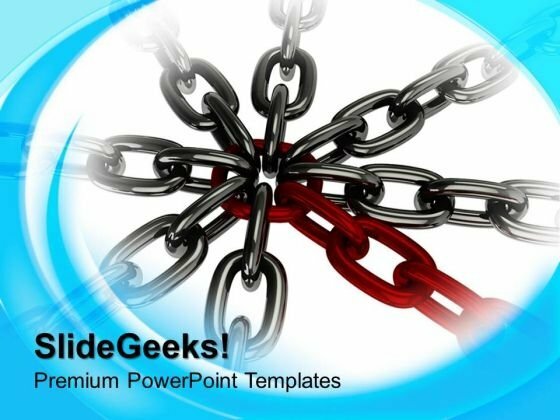 Chain Cross PowerPoint Templates And PowerPoint Themes 1012-Our Awesome Template consists of a design of chains crossed with each other which Targets the Security in Life, Business as shown above. This Template points to the Chain Security which signifies Team Work. It shows the number of chains crossed together to secure the family ,Business etc.-Chain Cross PowerPoint Templates And PowerPoint Themes 1012-This PowerPoint template can be used for presentations relating to-"Chain cross, security, business, chains, success, leadership" Examine the facts in all their combinations. Run the comb through with our Chain Cross PowerPoint Templates And PowerPoint Themes 1012. Deliver your address to your congregation. 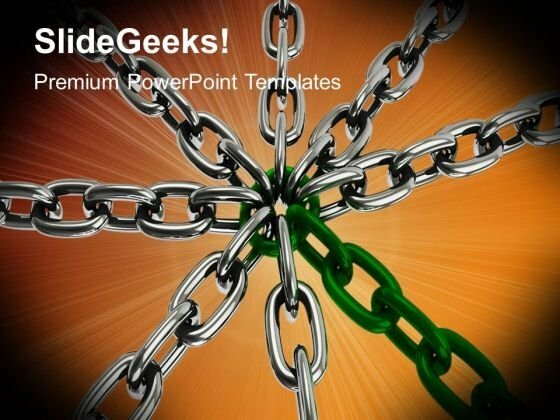 Give them a glimpse of the divine with our Chain Cross PowerPoint Templates And PowerPoint Themes 1012. 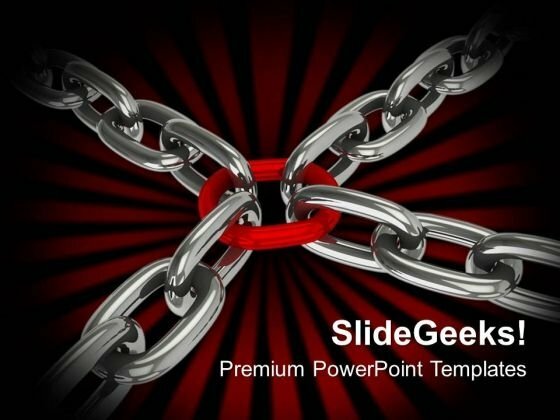 Chain Cross Security Leadership PowerPoint Templates And PowerPoint Themes 1012-Create stunning Microsoft office PPT Presentations with our professional templates containing a graphic of red ring connected with chains. This image has been professionally designed to emphasize the concept of strong group. It also depicts the concept of security. Our stunning image makes your presentations friendly and simpler showing that you care about even the smallest details.-Chain Cross Security Leadreship PowerPoint Templates And PowerPoint Themes 1012-This PowerPoint template can be used for presentations relating to-"Chain cross, security, business, chains, success, leadership" Use our Chain Cross Security Leadreship PowerPoint Templates And PowerPoint Themes 1012 as an experimental tool. Try them out to get the correct effect. Get to the core of the issue. Bring out the essence with our Chain Cross Security Leadreship PowerPoint Templates And PowerPoint Themes 1012.